EDMONTON, AB – Stony Plain Records, one of the world’s foremost roots music labels, announces a November 4 release date for Blues People, the new CD from award-winning singer, songwriter and musician Eric Bibb. Produced by Glen Scott, who also plays several instruments throughout, Blues People includes special guest performances by Taj Mahal, Guy Davis, The Blind Boys of Alabama, Ruthie Foster (who Eric has been touring with), Popa Chubby and a number of other musicians from around the world. The 15 tracks on Blues People include a number of Eric Bibb originals, as well as collaborations with other songwriters, plus songs written by Guy Davis (“Chocolate Man”), Rev. Gary Davis (“I Heard the Angels Singin’”) and the traditional, “Needed Time,” arranged by Taj Mahal, Eric Bibb and Glen Scott. 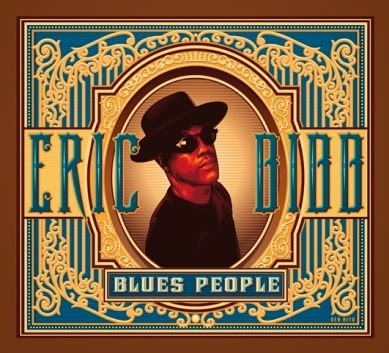 The concept of Blues People came to Eric Bibb, who’s won the Blues Music Award as “Acoustic Artist of the Year” and been nominated for a Grammy, when he was surrounded by his musical friends at the Blues Foundation Awards in Memphis a few years back. It inspired him to create a collection of songs about change and hope, in collaboration with many of his friends in the blues and roots music realm. “In the introduction to his classic book, Blues People, Amiri Baraka (who published it as LeRoi Jones) wrote: ‘The path the slave took to ‘citizenship’ is what I want to look at,’” writes Eric Bibb in the album’s liner notes. “That same path, along with its continuation, provided much inspiration for this album called Blues People. This record is also a tribute to the tribe of blues troubadours that I’m grateful to be a member of and it features the talents of several friends and heroes of mine. We, who traverse the highways and skyways of the planet playing the music known as blues, have become a rainbow tribe. We hail from many lands and cultures, bonded by our love of this music and the challenge of making it our own. What began in the fields of the southern United States, became a universal treasure, cherished by music lovers the world over. Eric was given his first guitar at age seven, and by the time he’d reached 16 was asked by his father to play guitar in the house band for the elder Bibb’s local New York City TV talent show. In 1970, Eric Bibb left New York City for Paris, meeting legendary guitarist Mickey Baker, and began to concentrate on playing blues guitar. He later moved to Europe and is now based in Finland, from which he tours extensively both in the U.S. and overseas. To watch a special video Eric Bibb created to explain the backstory about Blues People, click on this link: http://bit.ly/BluesPeopleVideo. Eric Bibb will be touring in support of Blues People and is booked by Folklore International Artists (www.FLiArtists.com). For more information, visit www.stonyplainrecords.com and www.ericbibb.com.